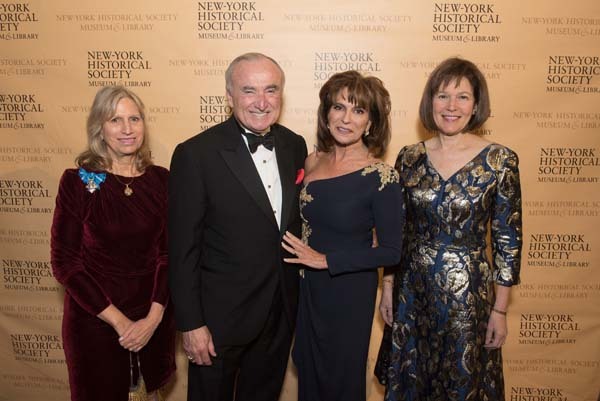 New-York Historical Society President Louise Mirrer, History Maker Award honoree William Bratton, History Maker Award honoree Rikki Klieman, Chair of New-York Historical Society’s Board of Trustees Pam Schafler. Photo by: Don Pollard. New York, NY—November 10, 2017—The New-York Historical Society presented William J. Bratton and Rikki Klieman with the 2017 History Makers Award during its annual History Makers Gala at Cipriani 25 Broadway on November 7, 2017. In addition, New-York Historical Trustee Bernard L. Schwartz received the Distinguished Service Award, presented by New-York Historical Society Board of Trustees Chairman Emeritus Roger Hertog. Actor Tom Selleck presented the award to Mr. Bratton, and journalist Tina Brown presented to Ms. Klieman. Ms. Klieman interviewed Mr. Bratton as part of the evening’s program. Four hundred thirty people were in attendance. This year’s gala raised more than $2.6 million, which benefit programs at the New-York Historical Society, including its major Museum exhibitions and its historical education programs for more than 200,000 New York City public school students. Past recipients of the History Maker Award include Ken Burns and Ric Burns (2016), Ron Chernow and Lin-Manuel Miranda (2015), Hillary Clinton (2014), David Petraeus (2013), Wynton Marsalis and Walter Isaacson (2012), and Henry Kissinger (2011), among others. William J. Bratton, Executive Chairman of Teneo Risk, was described by the New York Times as “the most widely recognized face in American policing” and is well-known for his two terms as the New York City police commissioner and serving as chief of police in Los Angeles and Police Commissioner in Boston. His innovative approaches to crime prevention and advocacy of community policing remain his legacy in the world of law enforcement. As the executive chairman of Teneo Risk, Commissioner Bratton advises clients on risk identification, prevention, and response. Rikki Klieman is the legal analyst for CBS News and was named one of the top five female trial lawyers in the country by Time. She remains Of Counsel to the Boston, Massachusetts law firm of Klieman & Lyons, where she specialized in criminal trial and appellate practice as well as civil litigation. She serves on the board of the Police Athletic League and the Women’s Forum of New York. Ms. Klieman lectures to various business and bar associations as well as charitable and school groups. Bernard L. Schwartz is a private investor, progressive public policy advocate, philanthropist, and retired industrialist. He is currently chairman and CEO of BLS Investments, LLC. Mr. Schwartz also manages the Bernard and Irene Schwartz Foundation and has served on the New-York Historical Board of Trustees for more than a decade. He will receive the Distinguished Service Award in recognition of his many contributions to American industry, civic life, economic policy development, and cultural enrichment, of which New-York Historical has been a long-standing beneficiary. Founded in 1804, the New-York Historical Society has a mission to explore the richly layered history of New York City, state, and the country, as well as to serve as a national forum for the discussion of issues surrounding the making and meaning of history. New-York Historical is recognized for engaging the public with deeply researched and far-ranging exhibitions, such as Alexander Hamilton: The Man Who Made Modern America; Slavery in New York; Nature and the American Vision: The Hudson River School at the New-York Historical Society; The Grateful Dead: Now Playing at the New-York Historical Society; Nueva York; WWII & NYC; The Armory Show at 100: Modern Art and Revolution; Chinese American: Exclusion/Inclusion; Superheroes in Gotham; The Folk Art Collection of Elie and Viola Nadelman, and The Battle of Brooklyn. Supporting these exhibitions and related education programs is one of the world’s greatest collections of historical artifacts, works of American art, and other materials documenting the history of the United States and New York. (through March 11, 2018), an in-depth look at 18th and early 19th century maps that illuminate the tremendous changes that occurred before, during, and just after the Revolutionary War.